Once again a holiday has snuck up on me. This week has been a whirlwind of assignments, study, baking, sewing halloween costumes and making treats for the little bears to take to school. I have promised myself that next year, I will be more organised and pace myself instead of the craziness that has been my week! 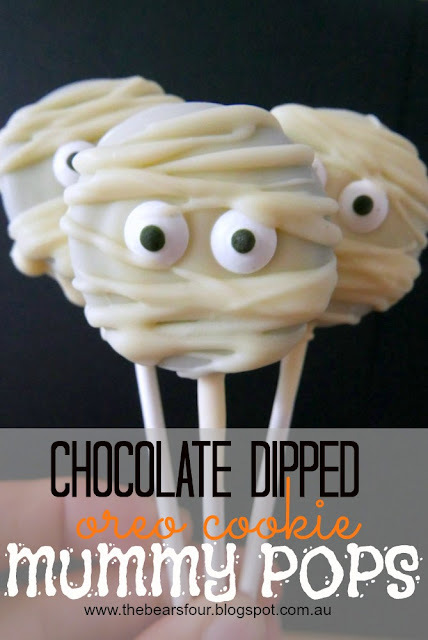 If you're looking for a relatively quick and fun treat to give the kiddos this halloween then these mummy pops are just the ticket. Read on for directions. Ok so the trick with this treat is to just make sure you have all of your supplies set up and ready before you begin since you'll be working with melted chocolate, which can set quickly depending on the climate you live in. Step 1: Start by inserting the lollipop sticks into each oreo cookie. Step 2: Melt the white chocolate melts over a bains-marie or in the microwave. Dip each oreo pop in the white chocolate and place them on a sheet of baking paper and add two candy eyes. Place in the fridge to set. Step 3: Once set, take the chocolate dipped oreos out of the fridge. Using a spoon dipped in the white chocolate, quickly go over each oreo pop in a zigzag pattern to spread the white chocolate over the cookies to look like mummy bandages. Place back in the fridge to set. Step 4: Place each mummy pop in a cellophane bag and tie with ribbon.